This is the presentation that I contributed to the GDC 2001. In here, I describe a 3D rendering technique for implementing volumetric fog. Download the demo executable (2 MB). Download the demo source code (36 KB). If you want to compile and run the source code, you'll need the data files, which are included with the demo executable. Just uncompress the ZIP file in the same directory as the source files. Nowadays, in the 3D-programming world, everybody is talking about multi-texturing and all the cool things you can use it for. But there are many different multi-texturing techniques that already require all the texture processing power in an accelerator, or even more. And besides, traditionally, the main reason for using a texture in 3D rendering is that you can add a lot of detail in one fell swoop. Fog, on the other hand, is usually a very low-resolution effect. Its main use so far is what's called "distance-fog", which is the use of fog to smoothly eliminate excess geometry that's a certain distance from the point of view, and to prevent popping as new geometry gets close enough to become visible. But fog can also be used to enhance the atmosphere and realism of a game or 3D scene. The techniques used to do that are usually called "volumetric fog techniques". What this class focuses on is how not to use those precious texture units for implementing different volumetric fog techniques. Instead, it is based on the premise that the geometry will be "dense enough" to avoid any major visible artifacts. "Dense enough" will have to be defined and adjusted by the engineer when he or she is using these techniques. In order to use vertex-interpolated volumetric fog effectively, there's a missing feature in today's consumer-level graphics hardware, and that is the ability to specify a fog color that changes throughout a mesh. To illustrate this, imagine an underwater scene where you use volumetric fog to darken the entrance into a cave. The normal, distance fog should be blue or green for the water, while the volumetric fog for the cave should be black. Now imagine, within that scene, a long eel emerging from the cave. The far end of the tail should be completely fogged in black, while the head should be fogged normally with the blue-green underwater distance fog. where Fragment represents the resulting color for a rendered pixel, texture is the surface's color normally read from a texture, diffuse is the interpolated diffuse color and specular is the interpolated specular color. All colors range from zero (black) to one (white), and the formulas are applied to all the components (red, green and blue) independently. which is the original formula supported by all current graphics hardware. There is only one problem with this method: the hardware will interpolate the newDiffuse and newSpecular values linearly, which means that neither one of the original interpolated values that we wanted (diffuse, specular, fog and fogColor) will interpolate linearly. This causes the polygons to have different pixel colors inside than if we had had independent interpolators. The visual results are not bad, anyway, and can be lessened by careful use of finer meshes. This technique is not only useful to render volumetric fog. It can also be used to render special effects without requiring additional geometry. Among others, you can have fog gradients (very useful in underwater environments and sunsets) and directional fog colors cues, like nuclear explosions in the far distance. 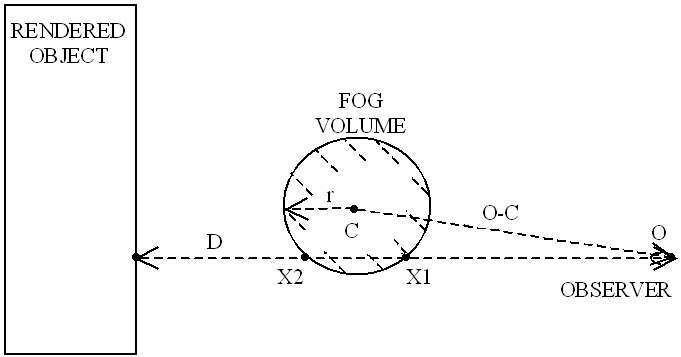 where camDistance is the distance from the observer (the camera) to the point that is being fogged, and clamp01(x) equals x if x is between 0 and 1, 0 if x is less than 0 and 1 if x is greater than 1.
where distance is the distance that the light must travel through a volume of fog (see Figure 2), and fogDensity = 1/(maxFog-minFog) is the fog density, which is a value that we will define in general as "one over the distance above which the fog covers everything completely". Distance = camDistance-minFog for normal, distance fog. In order to have volumetric fog, we'll need to somehow define the volumes of space where the fog will be confined. There are many different volumes to choose from, but in this talk we will concentrate on three basic volumes that are simple but very powerful: the half-space, the sphere and the ellipsoid, and also in the classic distance fog. Other volumes (cylinders, cones, convex hulls, etc…) can easily be used, provided that we research the appropriate math. Where X is a point on the line and t is the parameter, which is 0 at the observer and 1 at the object being rendered. The value of the parameter t for the intersection points is the result we will want. We will assume that any volumes used are non concave, so that only one segment of the ray will traverse through each of them. We will call t1 to the parameter for the point where the ray enters the fog volume and t2 to the parameter for the point where the ray exits. Note that the values calculated can be outside of the range (0, 1), in which case they will be clamped to that range later on in the actual algorithm. See Figure 1 for reference. So the half-plane of fog will extend towards infinity in the view direction in the first case, and backwards behind the observer in the second case. In the fog calculations, we will be using two points, which we will call t1 and t2, which represent respectively the point of entry into the fog and the point of exit. Therefore, we will want to make t1 = t and t2 = infinity, or t1 = -infinity and t2 = t, as appropriate depending on the sign of D·N. If D·N is 0, then the ray doesn’t intersect the volume boundary. In this case, if (P–O)·N<0, then the whole ray is inside of the volume, while if (P–O)·N>0, then the ray is outside of the volume. These formulas will always result in t1 <= t2, so the sphere of fog will lie between t1 and t2. If [(O–C)·D]2-D2·[(O-C)2-R2] is less than or equal to 0, then the ray doesn’t intersect the volume. Both the half-plane and the sphere are simple volumes that can be manipulated analytically without problem. But the ellipsoid is more complicated, so we will use a little trick that simplifies the calculations significantly. An ellipsoid can be seen as a unit sphere that has been scaled, stretched, rotated and translated in space. Now, scale, stretch, rotation and translation are all linear transformations that can be specified and manipulated using 4x4 matrices. The key here is that the resulting 4x4 matrix defines a linear transformation that is reversible, so we can always compute the inverse matrix (E), which can be used to transform the ray into the space where the ellipsoid becomes the unit sphere. Not only that, the t1 and t2 values calculated in that space are valid also in the world or camera spaces, where the ray was defined. Again, we know that t1 <= t2, so the ellipsoid of fog will lie between t1 and t2. Also, if (Oe·De)2 - De2*(Oe2 – 1) is less than or equal to 0, then the ray doesn’t intersect the volume. 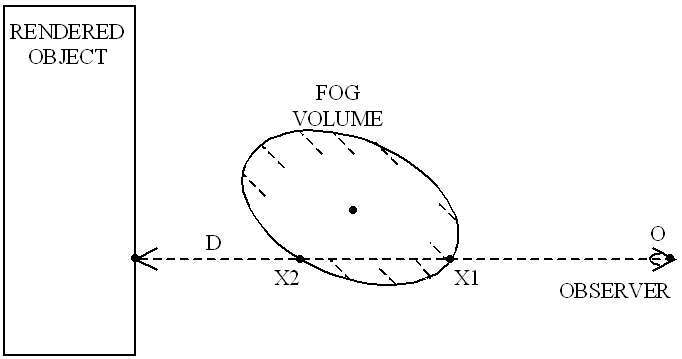 We will distinguish three possible implementations, ranging in difficulty: when there is only one fog volume, when there are several separate fog volumes, and when there are several interpenetrating fog volumes. Loop for each vertex with world position V.
Calculate D = V – O. If the ray intersects the volume. Calculate the points where the fog begins and ends: t1 and t2, where t1 < t2. Clamp those values between 0 and 1. Calculate distance = magnitude( D * (t2 – t1) ). Set fog = volFog. Set fogColor = volFogColor. Loop for each fog volume. Calculate volFog and volFogColor as indicated above. Set fog = fog + volFog – 1. Sorting front-to-back allows us to have an early exit in case a volume completely fogs out what it has behind. to ensure that the fog stays linear with the distance across the different volumes. 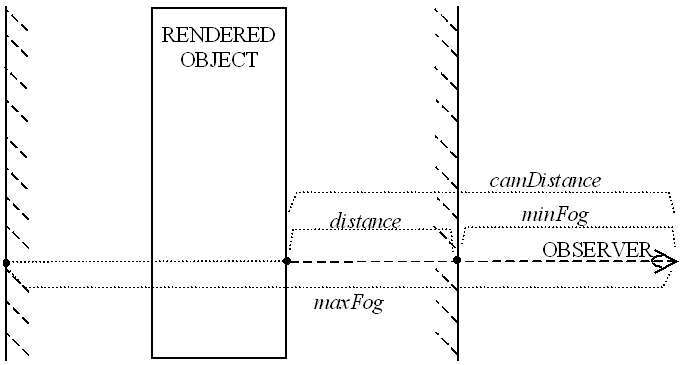 The most complex setup happens when two fog volumes share a portion of the range between the observer and the object being rendered. 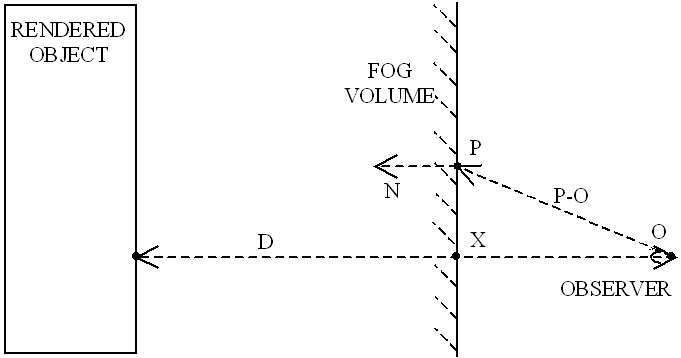 In Figure 6 we see what’s probably the most common case where interpenetrating happens: a fog volume that is inside of the distance fog. In this case, there’s no way to properly sort the two distinct volumes. 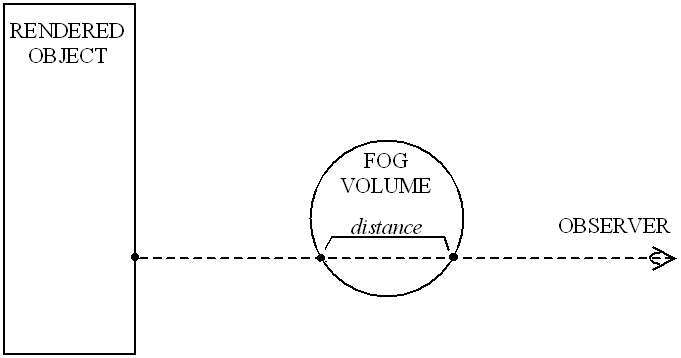 It’s not possible to assert that the volume is "behind" or "in front of" the distance fog. Of course, the thing can become pretty complicated really quickly, as shown in Figure 7. So, how can we generalize this to many volumes? Calculate t1 and t2, and clamp them to the range (0, 1). Add to the array: (t1, volFogColor*volFogDensity, volFogDensity). Add to the array: (t2, -volFogColor*volFogDensity, -volFogDensity). Sort the array on ascending values of t.
Initialize accumDensity = 0 and accumColor = (0, 0, 0). Set fog = 1, fogColor = (0, 0, 0) and lastT = 0. Loop for each entry in the array. If accumDensity is greater than 0. Set distance = (entryT – lastT) / magnitude(D). Calculate volFog = 1 - clamp01( distance * accumDensity ). Calculate volFogColor = accumColor / accumDensity. Set accumDensity = accumDdensity + entryDensity. Set accumColor = accumColor + entryColor. The sorting can be done very fast because the list is always likely to be already sorted. A bubble sort will do very nicely. The distance fog values are the ones that can easily be out of order, so it’s best to add them after the list has been sorted, using insertion sort. Implementation details will be discussed in the lecture during the GDC. Also, demos will be shown, demonstrating the different features and problems that this technique presents, and a short study on how some of this could be implemented using DirectX 8 vertex shaders. Also, alternative math formulas and adjustments will be discussed, with the aim of improving the visual quality and reducing the impact of visual artifacts. All demos, slides and additional material will be put available for download after the conference. The volumetric fog technique presented is an interesting application of the concepts of ray casting, renderer interpolators and 3D geometry math, and the range of effects that can be achieved is very encouraging. Nevertheless, the technique isn’t free of problems. The most important, visually, is that small fog volumes can reveal the polygon mesh layout along their edges. In order to avoid this, the fog volumes must be sensibly larger than the polygons rendered. Also, computationally, this technique puts a heavy strain on the vertex processing pipeline. This can make it unsuitable for some purposes. In any case, the technique is proven (it was used in the Ripcord Games title "Armor Command") and definitely worth studying in detail.